The rain has stopped, the sun has returned, and we are back to trail! After leaving Santee we made our way to Oakoasis Campground to continue west along our route. Taking a day off can do so much to rejuvenate the mindset- we feel refreshed and grateful to be walking once again. The route noticeably has shifted into something more urban, our path taking us along dirt roads and through neighborhood streets. We always pick up trash when we can, especially when we find balloons! The lights of San Diego are now within sight. We camp high up on a ridge just outside the town of Poway and fall asleep to the traffic noise of trucks whizzing by on Highway 67. The sounds of the highway were the first noises I heard when I woke up. The zooms and vrooms of hurried cars were a reminder that we are no longer far from the hubbub of city life. 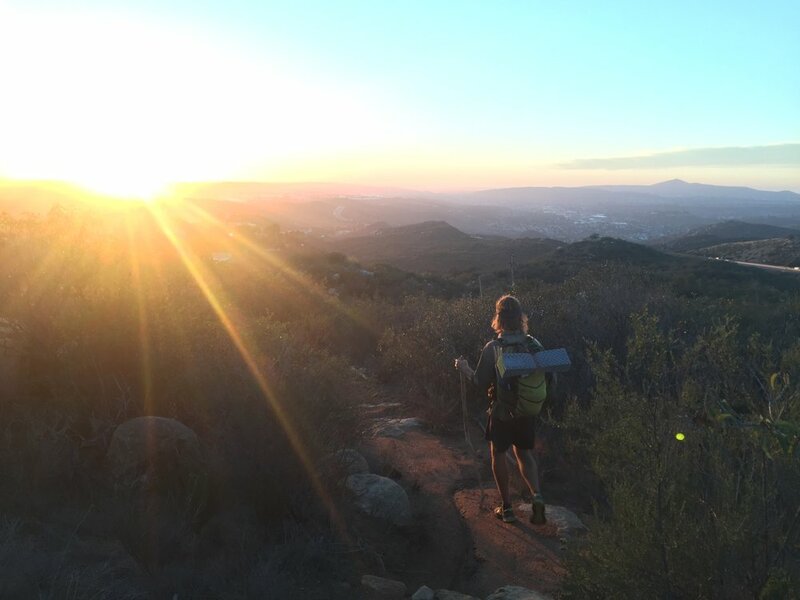 We left our campsite and hiked along a ridge trail on the outskirts of Poway. The morning miles consisted of rocky, steep climbs and descents through green, grassy pastures, as we followed a network of wide trails that skirted the town below. 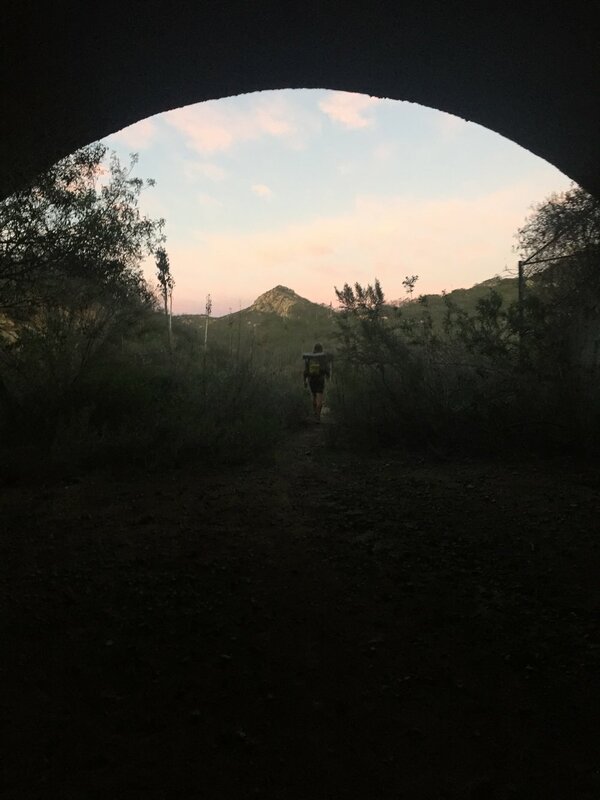 Los Peñsaquitos Canyon Trail was a welcome and appropriate conclusion to this journey. The sunset hours began as soon as we entered the trail, the afternoon light reflecting down through the trees and illuminating our conversations. These miles were memorable and full of gratitude, taking on an air of clarity as the ocean breeze beckoned us onward. We were thankful for everyone who had helped us, for our families, for our friends, and for each other. We arrived at the Los Peñsaquitos Marsh Preserve just before sunset. This would be the final push. Darkness fell and we walked cautiously through the marshy trail, guided by our headlamps and the sounds of croaking frogs surrounding us. Around the marshy corner I saw a strip of light from Highway 1. We carefully crossed the road and suddenly we were within steps of our finish line. We gleefully marched up to the edge of the ocean, placed our hands underneath the salty water, and jumped back like excited children when the crashing waves crept close to our feet. We sat on the rocky beach and ate our final trail dinner of this walking chapter.